Dark nutty and chocolatey, these vegan + gluten-free Chocolate Peanut Butter Cups get a superfood boost from maca and lucuma. 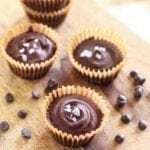 When ready to make the peanut butter cups, line a mini muffin tin with 12 liners. In a double boiler, melt half of the chocolate until runny. Pour this into each muffin liner, adding just enough to cover the bottom. Place the tin in the freezer for about 10 mins so the chocolate can harden. Remove the dough from the fridge and roll it into 12 small balls. (You may have some leftover for another batch, which can be frozen if needed.) Flatten slightly, then place one in each muffin tin cavity, in the middle of the hardened chocolate disks. Melt the remaining chocolate in the double boiler. Distribute it evenly between all of the muffin cups, covering the peanut butter balls in each one. Refrigerate or freeze until the chocolate has fully hardened. Store leftovers in the fridge or freezer.